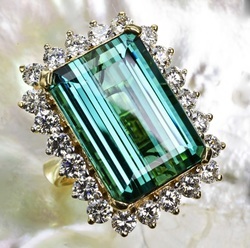 18k ring featuring Indicolite Tourmaline. When my grandfather, Jimmy Lo, first introduced the rainbow gemstone bracelet to the Hong Kong market in mid '70's, it created an instant sensation. At the time, most jewelers were only carrying a few different items- mainly gold, diamond and jade jewelry. My grandfather was a maverick and helped pave the way for the introduction of color gemstones set in wild and unique designs. Today, my father Lawrence Law, and I work together to continue introducing fanciful and bold designs incorporating the best in color gemstones. We constantly scour the globe looking for new and exciting gems. Here you will find our latest acquisitions and designs. We hope you enjoy our latest work as much as we enjoyed creating them. Check out our newest Morganite ring. It is a deep peach pink color at a whopping 19 cts with over 1 ct. of diamonds, set in 14k rose gold.